For the character from an alternate universe, see Velen (alternate universe). Velen has been the leader of the draenei people since their flight from Argus 25,000 years before the first orcish invasion of Azeroth. Known by his people as the Prophet, he has been granted the gift of the Sight, and — aided by the Light — rejected offers of dark power from Sargeras and has guided his people as they fled from, and later fought against, the Burning Legion and their former eredar brethren. He is first among the draenei and is the arch-nemesis (formerly best friend) of Kil'jaeden. Following the draenei's flight to Azeroth, they made a new home on the Azuremyst Isles and, sensing great courage in the Alliance, Velen and his followers pledged themselves to this noble faction. The strengthened Alliance then helped the draenei reclaim their former holdings from the Legion. Most recently, Velen used the heart of the naaru M'uru to sanctify the blood elves' tainted Sunwell, transforming the sacred fount into a source of holy and arcane energies. He also managed with the aid of the Conclave to bring the void god Saraka the Lighteater back to the Light as the naaru Saa'ra. Although the Legion's forces in Outland have been greatly diminished and the demonic invasion of Azeroth has been driven back, Velen remains fearful of an upcoming war between light and shadow. During the third invasion of the Burning Legion, Velen led the defense of the Exodar from a Legion attack led by his own son High General Rakeesh. After the deaths of both O'ros and Rakeesh, Velen renounced the title of prophet and declared the draenei are returning home to Argus. Younger Kil'jaeden, Velen and Archimonde. Twenty-five thousand years ago, the world of Argus was shaped into a paradise by the eredar race who called it home. Velen, who is known and respected for his immense wisdom, compassion and magical prowess, rose as a leader of Argus alongside Kil'jaeden, forming the Second Duumvirate. During Velen's time, a strange curse which addled its victims' minds and diminished their memories began to spread across Argus. Most of the eredar, terrified of the prospect of losing their precious knowledge, argued that quarantining or even banishing the afflicted was the best course of action to prevent the curse from spreading. Velen, however, refused to abandon his people. Using T'uure, an artifact which had fallen from the sky some time prior and which was in fact the shard of a deceased naaru, Velen walked among the afflicted at great risk to himself, calling upon the artifact's powers to cure all of the diseased eredar. Velen, Kil'jaeden and the eredar rulers' inner circle later bore witness to a grand demonstration held by the sorcerer Thal'kiel, who led an order of magi called the Wakeners. First, Thal'kiel summoned orderly rows of the old, familiar arcane constructs he and his followers were known for, but then he summoned a storm of infernal meteors to destroy the constructs as a symbolic display of the "new era" he foresaw for his people thanks to the arts of demonic summoning he had recently discovered. However, when he looked upon his colleagues' faces, Thal'kiel didn't see the approval he expected. Kil'jaeden's expression was remote and inscrutable, but Velen harshly condemned Thal'kiel's actions and forbade him from ever conjuring demons again, denouncing his "new era" as a failed experiment. Some time later, Thal'kiel resumed his experiments regardless, using cloaking magic to hide a demonic army he and his Wakeners were constructing with the purpose of installing him as dictator of Argus. The night before the planned coup, however, Thal'kiel's ambitious young apprentice, Archimonde, informed Velen and Kil'jaeden of his master's plans. To prove his loyalty to Argus' rulers, Archimonde himself led the attack on the Wakeners' secret training grounds and decapitated his former master with his own blade. Later, he would rise to rule the eredar alongside Velen and Kil'jaeden. Velen formed a deep friendship and affection with both Kil'jaeden and Archimonde. He even saw both of them as "extensions of his soul", so deep was their friendship. Velen and Kil'jaeden were particularly close, loving and respecting each other as brothers, as they had ruled Argus together long before Archimonde joined them. However, this peaceful state did not last forever. When Velen's son was born, Velen had a vision of himself holding a fel-corrupted eredar as he died, but he did not understand it. Velen discovers the truth behind Sargeras' words using the Ata'mal crystal. One day, the peace of the eredar was shattered. Sargeras, Destroyer of Worlds, had noticed their achievements. Instead of destroying Argus, Sargeras appeared before the three leaders in the form of a benevolent entity, offering to transform them into an even more powerful race of beings, with the goal of unifying all the races of the universe. In return, the eredar would serve him as his perfect spellcasters, spreading his universal union with every world they touched. Two of the eredar's triumvirate of leaders, Archimonde and Kil'jaeden, along with two-thirds of the eredar population, took the offer. Only one eredar leader realized the true horror of Sargeras' Burning Crusade: Velen. Velen, unlike Archimonde and Kil'jaeden, had the gift of "Sight", and was granted a vision by the naaru K'ure of the truth of Sargeras' plot. The utopia that Sargeras had promised was a lie, much to Velen's horror. He at first saw himself at the head of a vast eredar force of the Light, spreading the gifts of their race to worlds beyond count, as Sargeras had said; the next moment, he saw the truth. Sargeras had no intention of unification. His vision was one of death, of razing entire worlds to bare rock and ashes. And the eredar were not to be the bringers of enlightenment with their new powers; they would be man'ari, twisted, malevolent shadows of their former selves devoted to the destruction of worlds for the glory of Sargeras' terrible Burning Crusade. Horrified, Velen desperately prayed for guidance. K'ure appeared before him, reassured Velen that his plight had been heard, and instructed him to gather up his followers and go to the highest mountain on Argus, during the longest day of the year. The Genedar appears on Argus to rescue Velen and his followers. Velen asked his friend Talgath to gather his wife and son, but Talgath was on Kil'jaeden's side and delivered them to him instead. Talgath led a squad of man'ari eredar to pursue Velen's refugees, but they were held off by Hatuun who stayed behind. Velen and his followers barely escaped the newly created Burning Legion. From then on, Kil'jaeden vowed to hunt down Velen and his followers and slaughter them, even if it took a thousand years. As Argus grew smaller and smaller in the distance Velen begged the naaru to go back, but they told him that was not his path. Kil'jaeden would eventually take Velen's son under his wing and raise him as an agent of the Burning Legion named Rakeesh, meaning "butcher" in Eredun, letting Velen believe that the boy had been killed. During this time, despair gripped the renegades, and many even considered giving up, but Velen brought T'uure to bear and renewed his people's confidence and hope. The Legion chased the exiles, or "draenei" ("Exiled Ones") as they had come to be known, across the universe for thousands of years. Each time Kil'jaeden approached, the naaru granted new powers to Velen to preserve his race, though he eventually gifted T'uure to a promising young student named Askara. After millennia of flight, Velen and his people were finally able to evade the Legion settled on a world they named Draenor. Velen and the draenei were taken from Argus via the crystal-ship, the Genedar, that became known by the orcs as Oshu'gun — "Mountain of Spirits". After crash landing, Velen and his followers buried almost-dead naaru D'ore into a place that would be known as Auchindoun. As they settled onto their new homeworld, the draenei came into contact with the orcish clans, and began to trade with them; the relations with the orcs were cordial, but aloof and businesslike. While the draenei established themselves and built the city of Shattrath as their capital, Velen set up his own private refuge at the Temple of Karabor, on the eastern edge of the lands of the Shadowmoon Clan. While he was visiting the town of Telmor in Terokkar Forest, Velen met two orcs who would later shape the destiny of the Horde — Durotan, heir to the chieftainship of the Frostwolf clan, and the future Warchief Orgrim Doomhammer; Telmor's captain of the guard, Velen's friend Restalaan, had rescued them from an ogre attack. Their dinner discussions spoke much of the orcish heritage and of the prophecy relating to the Doomhammer, which Orgrim would receive upon the death of his father — the prophecy of how, after bringing salvation then doom in the hands of the last of the Doomhammer line, it would pass into the hands of one of non-Blackrock lineage, who would wield it and lead the orcs to salvation. Over the eons after their escape from Argus, Kil'jaeden continued his search for Velen and his followers, but was frustrated when he found only traces of where they had been. His agents had managed to locate Draenor, and reported back to him both the conditions the draenei lived in and the people that lived on their world. Realizing that he had found the tool of vengeance, Kil'jaeden appeared to the elder shaman Ner'zhul, and informed him that the draenei were plotting against them. Over a short span of time, the draenei came under increasing attack by the orcs, convinced that the draenei were their enemies. Concerned, Velen sent a courier to Ner'zhul, asking for a reason behind the attacks, and requesting a meeting in the shadow of Oshu'gun. The orcs, however, had killed the courier, and Ner'zhul did not wish to attend the meeting himself. Instead, he sent for Durotan, who captured Velen and his entourage. Velen tried to explain the true purpose of Oshu'gun to the Frostwolves but Durotan and his chief shaman, Drek'Thar, grew angered by what they perceived as blasphemy. Despite this, and despite the orders from Ner'zhul, Durotan released Velen and his fellows, taking their ata'mal crystals instead. Over time, attacks against the draenei became increasingly violent. The newly-established Horde, now directed by Ner'zhul's apprentice, Gul'dan - who had become Kil'jaeden's pupil in the art of the warlock - began to assault and destroy draenei settlements to appease their new master. Durotan led the assault on Telmor, utilizing one of the captured crystals to allow him to lower the draenei's defensive cover. Velen's refuge at the Temple of Karabor was also attacked and defiled by Gul'dan and his new warlocks, who renamed it the Black Temple and set it up as the headquarters of their Shadow Council. After the attacks increased — including the final assault that destroyed the city of Shattrath — Velen and some of his followers went into hiding in the marshes along the Zangar Sea, establishing Telredor, and were never found by either the orcs or Kil'jaeden's minions. Velen remained in contact with neighboring draenei's camps. Velen was granted a vision in which he saw the Broken: formerly healthy draenei who had de-evolved during the orcs' murderous crusade to wipe out the draenei race. According to Velen's vision, the Broken would rise to power once again and aid their displaced brethren. Velen's vision was given substance in the form of Nobundo, a one-time draenei vindicator who had regressed while the orcs decimated his race and tore the planet apart. Like his fellow Broken, Nobundo had lost contact with the Light, and so he ventured far into the deserts of Outland to meditate and pray for guidance. After decades of silence, an unfamiliar voice finally answered his prayers. It was not the Light that whispered to him, but the Wind. The breeze spoke to him of lost truths, of the might of the elements—of the delicate balance of power embraced by the shaman. Nobundo listened eagerly and learned all he could. When he judged the time was right, he departed the desert determined to use this knowledge to help the draenei race. However, most draenei refugees greeted the sight of a Broken with skepticism and outright prejudice. Only one of the healthy draenei did not shun the Broken: the wise and perceptive Velen. Nobundo visited Telredor but hesitated to speak with draenei about shamanism. He even wanted to leave, but thanks to the wise words of Velen, he remained and introduced shamanism to draenei. Velen had heard the philosophy of the shaman before, but Nobundo revealed new truths. The elements were timeless; they stretched across the cosmos to inhabit every world they touched. With the proper training, the draenei might learn to wield this overlooked, seemingly inexhaustible source of power. Velen rejoiced to realize that his vision was coming to pass. Velen and his remaining followers remained hidden over the decades that passed since the draenei were massacred by the demonically-possessed Horde. During that period, great changes occurred in Draenor: The Dark Portal to the world of Azeroth was opened, and the orcs invaded - but after years of warfare, they were finally defeated. When Ner'zhul, in a desperate attempt to escape Kil'Jaeden's wrath, tried to open portals to other worlds for the Horde to conquer, the incredible energies tore Draenor apart. In order to prevent this catastrophe from affecting their world, the Alliance Expedition under the command of the archmage Khadgar sealed the Dark Portal, cutting off both the orcs already in Azeroth and those they were battling on the fields of Hellfire Peninsula. Over a decade passed before anyone traveled through portals to Draenor—now known as Outland. The half-demon night elf Illidan Stormrage, accompanied by his naga and blood elf allies, sought refuge from Kil'jaeden after Illidan failed to destroy the Lich King, the imprisoned spirit of Ner'zhul who controlled the Scourge back in Azeroth. As the blood elves, under the command of Prince Kael'thas Sunstrider, took up residence in the naaru interdimensional fortress of Tempest Keep, Velen decided it was time to gather what remained of his people and find a new place to take refuge once more. Aided by the Broken Farseer Nobundo, who introduced shamanism to the draenei, Velen personally led a raid to capture the Exodar, one of Tempest Keep's satellite structures, and attempted to use it in order to escape Outland. The blood elves, realizing the draenei's intentions, sabotaged the transdimensional "engine" of the Exodar. As the draenei attempted to travel the dimensional planes, the reactor malfunctioned, hurtling the Exodar and its crew across the Twisting Nether until one month ago, where it appeared—coincidentally—in the world of Azeroth. The damaged Exodar screamed across the skies of northern Kalimdor, pods ejecting and spreading across a small island chain off the coast of Darkshore, before crashing on the west coast of what is now called Azuremyst Isle. After the dust settled and the draenei began to establish themselves in settlements built from the wreckage of the Exodar, Velen and his people set themselves to exploring their new homeworld. Inspired by tales of the heroic Alliance that stood against the might of the Burning Legion, the Draenei have come to enlist their aid in their continued resistance to the Burning Crusade. The time for the draenei shaman to test themselves draws near, for the battle against the Burning Legion is once again at hand. And the fate not only of Azeroth, but of all worlds, hangs in the balance. Velen in World of Warcraft. Having survived the crash, Velen continued to lead the draenei people from the Vault of Lights, deep inside the largest intact portion of the crashed Exodar, which served as the draenei capital in Azeroth. Velen and the draenei developed a friendship with the noble Alliance, something he had more or less foreseen in a prophecy. Together, they uncovered a conspiracy involving the Sunfury, the Venture Company, and their traitorous agents, Engineer "Spark" Overgrind and Sironas. Adventurers later reported to Velen that the blood elven Sunhawks were using Sun Gates, portals to Outland, to summon reinforcements and prime Kalimdor for a blood elven invasion, and that a traitor was among the draenei. Velen created a battle plan and ordered Vindicator Boros to organize the military campaign in order to end the blood elven menace once and for all. Velen later oversaw the trial of Matis the Cruel and sentenced him to execution. Velen was one of the many to congratulate the Alliance adventurer for repelling the blood elven invasion and defeating the man'ari traitor Sironas. Velen also revealed that the draenei adventurer's destiny lay in Outland and urged them to let any Outland draenei know of their new home. Led astray into the night, armed with the sword of broken Light. Broken, then betrayed by one, standing there bestride the sun. At darkest hour, redemption comes, in knightly lady sworn to blood. The first line refers to Silvermoon City and its destruction by the Scourge; the second to the blood elves' reverence of Prince Kael'thas, and his "gift" of the naaru M'uru to give power to the Blood Knight order; the third refers to the Blood Knights' discovery of Kael'thas' treachery (Kael'thas and his fel elves capture M'uru and take him to the Sunwell), and the fourth refers to Lady Liadrin, the Blood Knight leader, who renounces her ties to Kael'thas and swears her allegiance to the Sha'tar and the Shattered Sun Offensive. Following the defeat of Kil'jaeden in the Sunwell Plateau, Velen will arrive to congratulate the players, accompanied by Lady Liadrin, leader of the Blood Knights. Following the banishment of Kil'jaeden, Velen recovered the spark left after the defeat of M'uru and used it to recharge the Sunwell with holy energies, directly saving the Blood elf race from magical withdrawal despite the amount of wrongs the blood elf people have committed against him and his people. When the Lich King awoke, he sent his Scourge into all corners of Azeroth. To defeat the Plague of Undeath and necropolises, members of the Church of the Holy Light traveled to Shattrath and created an artifact of the Naaru's Light. Adventurers of the Alliance delivered it to Velen for defense. Velen was present at the meeting during the Elemental Unrest, discussing the earthquakes, stating that he could feel them in the Exodar and suggesting that the Alliance should flee while they still can. When Magni Bronzebeard was petrified, Velen sent Nobundo to represent the draenei at Magni Bronzebeard's memorial. The Prophet has largely remained in seclusion, focusing his energies on nothing save the coming battle between Light and Darkness. However, during  Remember the Light, Velen comes in person to the Harborage in the Swamp of Sorrows, to aid the desperate Anchorite Avuun in his tending to the mortally-injured Magtoor. Velen channels "Extreme Unction" (another term for "last rites") on the dying Broken, allowing him to be raised up by the Light. Shortly after the Shattering, Velen traveled to Darnassus to meet with the other leaders of the Alliance. Surprisingly, he had not been invited. Tyrande mentioned that they had assumed the draenei as a whole had declared themselves neutral after defeating Kil'jaeden. Velen dismissed the assumption and declared the draenei's allegiance to helping the Alliance, stating that they would remain on Azeroth for so long as they were needed. Nevertheless, he was treated as an honored guest. Even Malfurion wished to seek his opinion about the troubling matters of the Highborne murders. When King Varian Wrynn finally arrived at the summit with his son and started his disparagement of Genn Greymane, Velen was seen to have taken a sudden interest in Anduin. It was after the verbal brawl between the two kings, that Tyrande and Malfurion noticed Velen talking with Anduin about the Light, but were interrupted when the prince's personal guards came to retrieve him. Later, while the Prophet was meditating in the Temple Gardens, Anduin approached him again and resumed their talk about the Light. After overhearing the argument between Malfurion and Varian, Anduin informed his father about his decision to leave and train with Velen. When the young prince reassured Velen of his choice, the Prophet offered to take Anduin under his wing for a time and noted that he has a great destiny ahead of him within the Light. After taking Anduin under this tutelage, Velen sought to find the path that would lead to victory over the Burning Legion, losing himself in his visions and refusing to see anyone aside from the human prince. When human refugees from the Shattering made their way to Azuremyst Isle and camped out in front of the Exodar, Anduin questioned why he never warned anyone else about Deathwing. In answer, Velen showed him a vision of a world destroyed by the Burning Legion, and explained that despite the devastation wrought by Deathwing, finding a way to defeat the Burning Legion was of even greater importance. After Anduin left, though, Velen thought about the young prince's question, and wondered why the Light, which guided him through visions both true and false, had not directed him toward the Cataclysm. Later, Anduin tried to get Velen to see what was happening outside the Exodar. The refugees were unhappy and demanded to see the Prophet; he was needed in the here and now. When Velen turned to face Anduin, he had a sudden vision of a hero in gleaming armor, leading not just the Horde and Alliance, but the dragons and naaru as well in a battle against a vast and all consuming shadow. When the refugees started a riot, leading to a fight with the draenei guards, Anduin rushed to Velen, begging him to stop the needless slaughter. Anduin asked what the war against the Legion meant for those fighting outside, and reminded him that every life is a universe to be protected. Wondering how he had become so lost that he must be taught by a mortal child, Velen went outside and, in a booming voice, berated both the refugees and his fellow draenei for what had occurred, walking out onto the blood-soaked ground to help heal the fallen. Realizing that he had become so focused on the future that he had lost sight of the present, he resolved that the draenei would go out into Azeroth and help heal the world. After Deathwing's defeat, Velen still kept Anduin under his tutelage, teaching him something new almost every single day. When Theramore was in danger of being invaded by the Horde, Jaina Proudmoore asked Velen for help. At some point after the Alliance and Horde's landing in Pandaria, Prince Anduin Wrynn was heavily wounded: his bones broken after a confrontation with Garrosh Hellscream. He was carried to safety at Lion's Landing and is under emergency care. King Varian, while tending to his son, has summoned Velen to Lion's Landing to help his son. However, in 5.2 Anduin states that he was healed by Pandaren Mistweavers. Velen did the initial healing while the monks did the rest. Velen told him that the pain won't go away and may increase with age. With Garrosh's attack against Anduin and his possession of the Heart of Y'Shaarj, the Prophet suspected that the warchief's leadership would end in disaster, not only for the Alliance but for all of Azeroth as well. According to Maraad, Velen is currently on Pandaria in the north, presumably in Kun-Lai Summit. He wants to have good relationships and learn new knowledge. Velen, alongside other Alliance leaders received a letter from Xuen inviting them to the trial of Garrosh Hellscream and was present in the Temple of the White Tiger at first accompanied by Anduin. He was the first witness of Tyrande, retelling the events of Durotan's visit to Telmor. He told Baine that he believes that every orc can change, as Grom did, so can Garrosh. Velen with Moira Thaurissan and Alonsus Faol in Dalaran. Velen attends the funeral of Varian Wrynn, who he considered a good friend. He argues with Jaina about fighting the Horde, saying that quarreling between the Alliance leaders is exactly what the Burning Legion wants and that his people have learned the price of trying to face the Legion while divided. Velen believes that now is the time that they need to join the Horde's strength to their own. It was revealed that Velen has been working with Alonsus Faol and Moira Thaurissan against those who would harm Azeroth. After Faol decides to send a priest adventurer to claim a weapon of great power, he joins Faol in Dalaran in order to travel to Netherlight Temple. There the assembled priests combine their powers and the adventurer uses their artifact to reverse Saraka the Lighteater back into Saa'ra. Velen is present during Balnazzar's attack on Netherlight Temple and the arrival of Lothraxion of the long-prophesied Army of the Light. Velen holding the body of Rakeesh. Following Khadgar's guidance, an adventurer comes to deliver a mysterious lightbound object to Velen, but at that same time the Legion begins an invasion of the Exodar, led by the eredar High General Rakeesh. After the adventurer helps to save draenei citizens and fight off demonic invaders, Velen reveals that the object is known as [Light's Heart], the sentience core of the naaru prime: Xe'ra. Locked away within the core is wisdom crucial to the battle against the Legion, and only naaru born of Xe'ra can unlock it. O'ros is the last of this line, and the true purpose of the Legion's invasion of the Exodar was to destroy O'ros before the core could be unlocked. However, Rakeesh beats Velen and the adventurer to O'ros, destroying the naaru. They are joined by two of the adventurer's champions in the battle against the eredar general, and are successful in driving him to the brink of defeat, at which point he activates a self-destruct in his Fel Annihilator, threatening to destroy the entire Exodar and everyone inside it. However, as the heroes battle to defeat the eredar in time, Velen has a sudden realisation, and without explanation demands that the heroes stop attacking Rakeesh. When the heroes refuse, Velen even turns against the adventurer, attempting to stop them by force, but ultimately Rakeesh is defeated. To the surprise of the heroes, Velen kneels down and cradles the head of the eredar to his chest as he dies. Velen reveals that before the coming of the Legion he had a son, and when his son was born a vision had come to him of this day, in which he wept as he held a dying eredar in his arms; only now did he realise that Rakeesh was in fact his son, another example of Kil'jaeden's "creative" punishments. Velen is stricken by the death of his son, and tells the adventurer to return the Light's Heart to Khadgar and tell him "the Light died here this day." As the adventurer prepares to leave, Velen speaks to the Light's Chosen, renouncing the title of Prophet and declaring that he is no longer either prophet or pawn. After checking that Romuul survived the attack, Velen orders him to begin repairs on the vessel, telling the Chosen that the draenei are going home. When an Alliance player reaches Prestige Rank 2, Velen can be found in Stormwind Keep alongside other notable leaders of the Alliance. During  A Royal Audience, he is present at the ceremony hosted by King Anduin Wrynn that congratulates the character for their battles against the Horde, following their receiving of the [Grand Marshal's Medal of Valor] from the King, as well as an artifact appearance. Velen with Khadgar and the order hall champions. Velen and champions of the order halls traveled to Krasus' Landing, where Khadgar spoke about using the Pillars of Creation to close the portal at the Tomb of Sargeras. However, Velen reminded all assembled that Gul'dan was merely a pawn and Kil'jaeden was still out there. Kil'jaeden, watching this all from his ship in orbit above Argus, sent Legion ships to assault Dalaran. While Khadgar looked worried as cries of alarm were heard around them, Velen did not look particularly surprised in light of his warning. Velen joins in the second battle for the Broken Shore, where he identifies Mephistroth and tells Maiev Shadowsong and Illidan Stormrage to stop arguing. Afterward, he tells Illidan to enter the Cathedral of Eternal Night and secure the [Aegis of Aggramar] while he and Khadgar enter the Tomb of Sargeras itself. Maiev insists on going with Illidan, saying that Velen trusts him too easily. Velen and Khadgar's initial assault on the tomb was a failure, and Khadgar informed the team inside the Cathedral of Eternal Night of this just before they activated the Aegis. After the heart of Highlord Kruul is stolen from the vaults of Dalaran, Velen observes the Tomb of Sargeras from Krasus' Landing and receives a vision of Kruul regenerating within the Nether, his heart hastening the process. He sends Kor'vas Bloodthorn and an adventurer to the Stair of Destiny in Hellfire Peninsula, where they pry open a doorway to Kruul's realm. Later, the adventurer, Kor'vas, and Velen confronted Kruul inside the Twisting Nether. Before he could die Kruul overloaded himself with power to self-destruct and kill his opponents along with him, but Velen saved Kor'vas and the adventurer. Since an Alliance hero found King Varian's lost compass on the Broken Shore and returned it to the newly-crowned King Anduin, Anduin has not been eating or sleeping. Velen and Genn Greymane attempt to console Anduin, but to no avail. When he leaves for the Cathedral of Light to pray, the two of them call on the hero to try and break Anduin out of his melancholy. Later, Velen and Genn have a discussion in Stormwind Keep. While Velen foresaw Anduin becoming a great leader, Genn insists that visions don't win wars and Anduin may have a good heart but is untested. Nonetheless, Velen believes that the Light is strong with Anduin and he has faith Anduin will grow into his crown. Genn continues to insist that they and he need more than faith. Anduin, having overheard the conversation, travels to the Broken Shore in secret and has the adventurer tell his advisors where he has gone since if he told them himself, they'd only stop him. The adventurer tells only Velen, who is understanding of Anduin's decision and will relay the message to Genn when the time is right. At Wrynnfall in front of the Tomb of Sargeras, Genn shows Velen the site of Varian's death, and Velen comments that Anduin does not know the Legion like they do. Anduin arrives and reveals his worries and doubts about living up to his father's legacy. The young king finds one of the two blades comprising his father's sword Shalamayne under the ash and sand and falls to his knees, but encouraging words from Genn and an image of his father cause Anduin to regain hope as the sword glows in his hands. Within the Tomb of Sargeras, Velen confronted Kil'jaeden with Khadgar and Illidan while adventurers battled the Fallen Avatar. Although Khadgar voiced his desire to seal the portal, Velen declared he was done hiding and followed Kil'jaeden into the Twisting Nether. Aboard Kil'jaeden's command ship within the Twisting Nether, Velen confronted his old friend and declared his intent to stop Kil'jaeden's hunt across the stars. Kil'jaeden told Velen that he had lacked vision back then and refused to see the Legion's inevitable victory, while Velen insisted that Kil'jaeden had lost faith in the Light, and if the two of them had worked together they could have resisted Sargeras and saved Argus. Kil'jaeden questioned if the Light had saved Velen's son, or if what shone in Rakeesh's eyes when he died was hatred for the father who had abandoned him. Enraged, Velen declared his intent to fight alongside Azeroth's champions against Kil'jaeden and end his crusade. Upon Kil'jaeden's defeat his ship began to crash toward Argus. As Kil'jaeden was on his deathbed, he told Velen that he was always envious of the latter's gift, faith and vision. Kil'jaeden had never believed that Sargeras could be stopped, but wonders if perhaps Velen will prove him wrong. As he died and Khadgar prepared to teleport everyone back to Azeroth through a rift Illidan had opened with the [Sargerite Keystone], Velen silently placed a hand on Kil'jaeden's forehead. When the heroes of Azeroth vanished before him, Kil'jaeden closed his eyes as the fel within him caused an explosion that took out his ship. In the last moments of Kil'jaeden's life, Velen realized he had to let go of the past not only for his own sake but for Rakeesh's memory as well. Upon their return to Azeroth however, it was revealed that Illidan had left the rift from Azeroth to Argus open, and Argus became visible on Azeroth's sky. Khadgar, horrified, asked Illidan what he had done, and Illidan responded that sometimes the hand of fate must be forced. When Khadgar's teleport brought them to Azsuna, they saw Argus in the sky above them. The forces aboard the Vindicaar prepare to assault Argus. In secret, the draenei had been building a new dimensional ship called the Vindicaar to prepare to go to Argus. Velen gathered allies to join him in the assault on the draenei homeworld. Aboard it above Azuremyst Isle, while final preparations were underway, Illidan confronted Velen about his faith; how he had allowed Sargeras to corrupt Archimonde and Kil'jaeden, and allowed the Legion to take Argus, and through it all did nothing, all the time believing he was following the Light's will. When Illidan told Velen that his people's blood was on his hands, Velen snapped that Illidan would never understand what he did to save his people, to which Illidan replied that the Light was holding him back and Velen should forge his own path. At this time, Grand Artificer Romuul arrived and told Velen that the Vindicaar was ready for its trip to Argus. After arriving above Krokuun, Illidan was at first dismissive of the Army of the Light that Velen had intended to ally with as they were nowhere to be found. When the Xenedar appeared soon after the Vindicaar's arrival, it was quickly shot down by the Burning Legion and Azeroth's forces rallied to begin the final battle for Argus. During the chaos of the battle, Velen heard of hooded Krokul that lived on Argus, used as slaves by the Legion. After defeating the Antaen Light-Breaker alongside Illidan and heroes, he traveled to the Krokul Hovel where he discovered his old friend Hatuun was the leader of the survivors on Argus, but Hatuun hated him for leaving them behind. Velen also met Turalyon, High Exarch of the Army of the Light, at last. When it was discovered that the titan Aggramar had been revived by Sargeras as the first of a new "Dark Pantheon", Velen decided that they needed to travel to his home of Mac'Aree to retrieve the Crown of the Triumvirate, an ancient eredar relic which he held one piece of, and Archimonde's and Kil'jaeden's should still have been in the ruined city. Returning to Mac'Aree was hard on Velen, who remembered the day he fled and had to deal with the ghosts of eredar who died that day. When Archimonde's piece, the [Sigil of Awakening], was secured, Velen contemplated on how Archimonde was disdainful of the Crown because alone his piece gave him little power, and if he had anticipated its use to them he surely would have destroyed it long ago. Retrieving the Sigil of Awakening attracted the attention of the Burning Legion, who came to Mac'Aree to hunt down the forces of Azeroth. Velen had traveled with the Army of the Light to the Arinor Gardens to search for the Crest of Knowledge, Kil'jaeden's piece of the Crown of the Triumvirate, prompting Turalyon and an adventurer to go and try to save them before it was too late. Velen was found in the ruins of his old home, before the childhood bed of his son, who he asked to forgive him. Once they reunited, Velen revealed that his old friend Talgath was the leader of the Legion's presence on Mac'Aree and aimed to take the Crest of Knowledge beyond their reach. At Kil'jaeden's Terrace they learned that long ago Kil'jaeden had thrown the Crest in the Seat of the Triumvirate to rot alongside L'ura. After Velen recalled the day Sargeras came to the eredar, Talgath arrived to confront his old friend. Talgath commented on how unlike Velen it is for the Prophet to stand his ground, but that it was a welcome change of pace. Velen attempted to reach a peaceful solution and told Talgath to stand down, but Talgath refused. During the battle Talgath taunted Velen, telling him how his departure wounded Kil'jaeden and how cold Velen had been leaving his wife and son behind. When Talgath was about to lose he attempted to flee, but Velen bound him with chains of light. Velen once more tried to get Talgath to help them find the Crest of Knowledge, but Talgath responded that they were too late, and not even the Light could escape the Seat of the Triumvirate where the Crest was hidden. Afterwards, Velen killed his old friend with a burst of holy magic. With Talgath defeated, Velen realized from Talgath's words that the naaru L'ura had fallen to the Void. This concept was a foreign one to Turalyon, who thought it impossible for a naaru to fall to darkness. As Velen explained, there was much Xe'ra had not wanted Turalyon to know. Alleria and an adventurer would be the ones to break into the temple, defeat L'ura, and retrieve the Crest of Knowledge. When they returned having slain L'ura, Velen voiced his mourning for the naaru. He placed his own piece, the Eye of Prophecy located on his staff, with the other two to complete the Crown of the Triumvirate and empower the Vindicaar. The fight could now be taken to Antorus, the Burning Throne. As Argus the Unmaker was left in the hands of the titans to seal Sargeras at the Seat of the Pantheon, Velen and the heroes of Azeroth returned to the Vindicaar. Illidan, however, stayed behind, to serve as the Dark Titan's jailer. Before leaving, Velen admitted that their survival was never in fate's hands and wished for the Light to be with him. After Sargeras was imprisoned, Velen talked about the countless nights of his life that were spent dreaming of returning to Argus, of seeing what had become of his home and saving it. There was no salvation to be had, but they did find victory. What would come next Velen couldn't say, but he would not wait for visions to guide him. He would do all he could to support Anduin, and to ensure he was prepared to face the threat that loomed in the darkness. When King Anduin Wrynn summoned his councilors to Stormwind's map room to discuss opinions on Azerite, both Genn Greymane and Prophet Velen marveled at its power but were also aware of its potential for misuse. Sometime later, Anduin had breakfast with Genn and Velen and the two advised Anduin on how to go about his diplomatic tour. When Anduin asked Velen if he had any suggestions of what Stormwind could do to show its appreciation for the draenei, Velen told Anduin that his consideration about them was enough. Even so, Anduin insisted that they think of something tangible to gift the draenei and Velen smiled at his thoughtfulness. Velen accompanied Anduin in his diplomatic tour and attended the feast with the Council of Three Hammers in celebration of Stormwind's gift to Ironforge. By the time desert was to be served, Velen left with Falstad and Muradin to let Anduin and Moira speak. Later on, he was one of the Alliance leaders summoned by Magni Bronzebeard for a meeting. Velen heeded Magni's plea for healers to heal Azeroth and Anduin's discovery of Azerite. Following Moira's suggestion, Velen, Moira, and Anduin traveled to the Netherlight Temple to recruit the Conclave in their mission to heal Azeroth. Later on, Velen returned to the draenei to spur their efforts in healing Azeroth while Anduin went to Darnassus to check on the night elves' progress. Following the death of King Anduin Wrynn's manservant Wyll Benton, King Anduin would later summon his advisers along with Alleria Windrunner and High Exarch Turalyon to the map room to unveil his plan for a Gathering between the Forsaken and their human loved ones. Velen was the only adviser in support of Anduin's idea as he believed the Gathering's success to be a stepping stone to peace and was worth the attempt despite the risks. The Gathering ended in tragedy however, and Velen went to council Anduin in his despair. Though Anduin longed for the innocence of his youth when he trained with Velen in the Exodar, Velen told him they cannot go back to the past and he must face the hardships of being king. Velen advised Anduin to first find peace within himself before comforting others, elaborating that priests can only heal if they are steady themselves. He urged Anduin to go to the Netherlight Temple and grieve with Alonsus Faol and also to seek Saa'ra's council so he may know how to guide his people in coping with the tragic events. After SI:7 reports indicated that Warchief Sylvanas Windrunner had endorsed the campaign to conquer Silithus and monopolize Azerite, Velen and the other Alliance leaders deliberated on their course of action. Tyrande Whisperwind stated that if the Alliance was in agreement, her army stood ready to deter the Horde's campaign. Though Velen had hoped for a period of peace after the Argus Campaign, he also agreed with the other Alliance leaders' assessment and supported the deployment of night elven troops. Since the Argus Campaign had taxed the draenei heavily, the draenei's contributions to the Alliance war effort was very minimal. Velen stated he hoped the troops sent to Silithus would deter the Horde from war and that they would end up being unnecessary. While Velen and other Alliance leaders were at Stormwind City aiding in the planning for the upcoming war, the Horde saw an opportunity to attack Ashenvale. With the night elf fleet en route to Silithus, Ashenvale had only Malfurion and an insufficient amount of defenders to defend it. When word reached Stormwind of the Horde invasion, the Alliance leaders realized that the Horde had deceived them into weakening Ashenvale's defenses. Though King Anduin took responsibility for the military failure, Velen comforted him by saying older heads than his could not have predicted this outcome. The Alliance leaders coordinated with each other to accommodate as many refugees as possible and to reinforce the Ashenvale warfront. Velen aided in the escorting of refugees to the Cathedral of Light and spent the remainder of the War of the Thorns tending to the refugees' needs. Velen can be found in the War Room of Stormwind Keep, helping the Alliance strategize for the war. He briefed adventurers about the disagreement between Tyrande Whisperwind and King Anduin Wrynn regarding the allocation of troops for Tyrande's campaign to reclaim Darkshore. Since Anduin could not provide any military aid at that moment, the night elves and their Gilnean allies went to fight for Darkshore by themselves. The subject of this section did not make it out of the PTR stages of patch 7.3.0. The encounter with Velen is generally considered the easiest of the faction leaders, and the virtually non-existent player traffic within the Exodar leaves room for planning. It is often the first city to be attacked during a "For the Horde!" raid, due to its simplicity. The raid should group up at the stairs, and to play it safe, pull Velen's two battlemasters before him. With them down, the raid can freely focus on Velen. Velen pulls with his battlemasters, though if disposed of beforehand will only be protected by his Shield of Velen elite guards. One tank is enough to hold him in such a case. Velen's abilities are not particularly potent, even after the step up to Cataclysm level difficulty. His shield is easily broken, and his infrequent use of [Holy Nova] can be easily healed through. His Holy Smite ability will be randomly cast on a raid member. For the most part, the encounter is a good example of tank and spank, and the extremely low chance of an Alliance defense raid allows breathing space. Holy Blast — Blasts an enemy with Holy magic, inflicting 9625 to 12375 Holy damage and knocking the enemy back. Holy Nova — Causes an explosion of divine light, inflicting 18900 to 23100 Holy damage to nearby enemies. Holy Smite — Smites an enemy, inflicting Holy damage. Prayer of Healing — Invokes Holy magic to heal nearby party members. Staff Strike — Strikes at an enemy, inflicting increased melee damage. "Yes, I am the cautious one, and sometimes my caution has saved us as much as your decisiveness, Kil'jaeden, and your instinctive impetuosity, Archimonde." To begin with, 'draenei' is not our true name. It is a term that means...'exiled ones.'" We disagreed with others in our world. We chose not to sell our people into slavery, and for that we were exiled. We have spent much time finding a suitable place to dwell—a place to call our own. We fell in love with this land, and we call it Draenor. We must unite against the Legion. The Light will not forsake us. This is no longer the Argus I remember. I have spent too long depending on visions to guide me. It is time we forge our own fate. Part of that is finding new allies to stand beside us. He was planned to be involved in the Maiden of Vigilance encounter. Although he said he is no longer a prophet during the finale of [100 - 110] Bringer of the Light, he is still seen with the title on Argus. Velen once visited Tyrande and told her of the similarities between Elune and the naaru. Tyrande thanked him for his input but then cordially requested that he refrain from making such outlandish claims when in Darnassus or in the presence of Elune's priesthood. 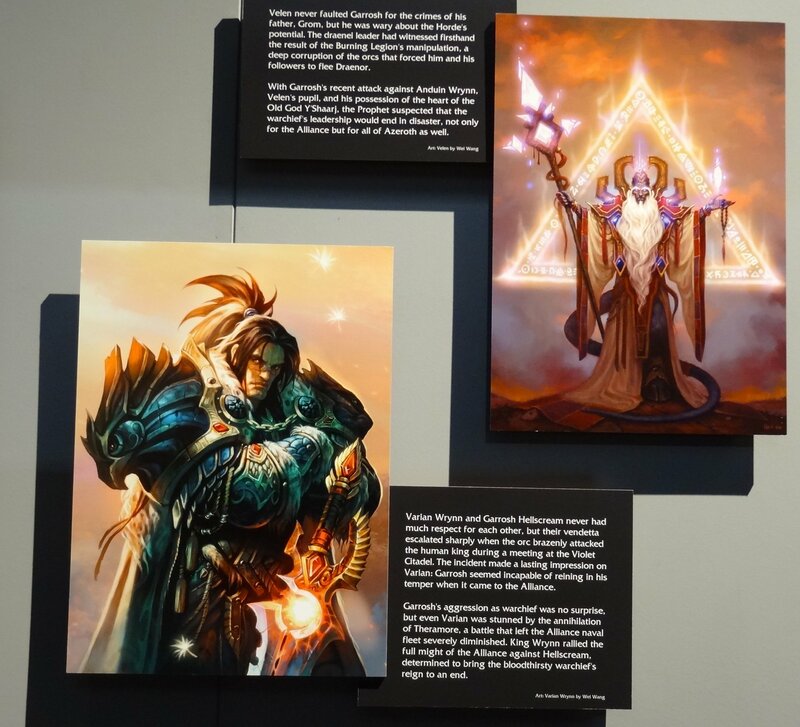 In the original Ultimate Visual Guide, Velen was stated to be an eredar. It was changed to a draenei in the second version. Velen never faulted Garrosh for the crimes of his father, Grommash, but was wary about the Horde's potential. During the battle in the Temple of the White Tiger, Velen is among the individuals whose alternate selves wasn't summoned by the Hourglass of Time. According to Christie Golden, she only selected alternate individuals that she felt brought the most impact on their main timeline counterparts. Velen is considered to be immortal. Kil'jaeden believes that Velen was the most powerful and wise of the three eredar leaders on Argus, as well as the one most attuned to arcane magic and science. In Rise of the Horde, Velen used a very advanced form of magic to prevent Archimonde and Kil'jaeden from finding out his attempt to gather those who were willing to follow him after being revealed of Sargeras' duplicity. Velen also managed to fake the Ata'mal crystal by replacing it with a convincingly simple crystal with appearance and glow of the original. A TCG artwork shows Velen with flame behind him while he unleashes an energy beam, a testament to his own power. He is described as having glowing blue eyes and his skin color is officially alabaster, as it was in Rise of the Horde and Wolfheart. His in-game model and the cinematics depict the body and eye colors as violet. In Argus, when depicting Velen in visions of past, he has violet color despite it being described as blue in Rise of the Horde at that period. During the event following Kil'jaeden's defeat at the Sunwell, Velen calls Kil'jaeden his "brother". They at least treated each other like brothers; "Kil'jaeden had loved Velen as a brother, closer than that, loved him almost as another aspect of himself". Unlike other draenei, Velen's [Gift of the Naaru] forehead signet is permanently visible. The Alliance's tier 9 priest sets, Velen's Regalia are named after the Prophet, highlighting his great connection to the Light. Velen is listed as a shaman in the World of Warcraft Trading Card Game, though there is nothing in lore to indicate that he is one. This may have been done to emphasize the fact that the draenei were the first Alliance race to have shamans, as Lor'themar Theron, who was added in the same set, is a paladin in the card game despite being an elven ranger in lore. Alternatively, it's simply a mistake. When The Burning Crusade was first released, Velen had the speech file of a normal male draenei. However, upon the release of Patch 2.1.0, Velen was given his own voice file (see below for quotes). Velen wields the [Exodar Life-Staff], which serves as a focal point for his magic and provides light to all who seek it. Art featuring Velen always showed him wielding the Life-Staff, which he was also seen with after the defeat of Kil'jaeden at the Sunwell. However, it was not until the Cataclsym expansion that Velen properly wielded the staff within the Exodar. The crystal on Velen's staff is actually his piece of the Crown of the Triumvirate. After [110D] Seat of the Triumvirate: The Crest of Knowledge when he places his piece on the Crown, the crystal on his staff is gone. Velen was voiced by Alan Shearman in Burning Crusade and is now voiced by David Shaughnessy in Legion. One of Velen's quotes - "Not all who wander are lost" - may be based on a line from the poem All That Is Gold Does Not Glitter in J.R.R. Tolkien's The Lord of the Rings. The name Velen may be related to a character from the sci-fi television series, Babylon 5: Valen. Several general details between the two characters seem similar. Valen appeared aboard a starship seemingly out of nowhere to aid the Minbari in their war against the chaotic Shadows, much as Velen and the draenei crashed on Azeroth just in time to help fight the Burning Legion. Both seem to posses some method of prophecy, and both have contact with a higher race of beings of light, Velen the naaru, Valen the Vorlons. Christie Golden confirmed that she indeed watched Babylon 5, but Velen is not her creation. Velen appears as a legendary card for the Priest class in Hearthstone. His flavor text reads: "He's been exiled from his home, and all his brothers turned evil, but otherwise he doesn't have a lot to complain about." In the Goblins vs Gnomes expansion, there is also a common Priest spell called Velen's Chosen. Its flavor text reads: "Velen wrote a "Lovely Card" for Tyrande with a picture of the Deeprun Tram that said "I Choo-Choo-Choose you!"" Although [100 - 110] Bringer of the Light states that Velen's son was taken by Kil'jaeden thirteen thousand years ago,  Mac'Aree, Jewel of Argus stating that Velen lost him on Argus would put Rakeesh's capture at twenty five thousand years ago. It is said that Velen uses [Prophet's Guidestone] to reach out to his people across vast distances. He is referred to as a seer and a sage. There's a server named after him: Server:Velen US. Based on his prophetic visions, he might be considered a diviner. Velen's appearance before Warlords of Draenor. Velen attending the meeting of the Alliance leaders. Prophet Velen by Wei Wang. Given a new staff model. ^ Rise of the Horde, chapter 9. ^ Rise of the Horde, 1-18. ^ Jaina Proudmoore: Tides of War, pg. 39: "I'm learning something new almost every single day." ^ Jaina Proudmoore: Tides of War, 128- 129: Jaina: "I'll be contacting the other Alliance leaders as well.[...] I think even the draenei would be willing to help." ^ Rise of the Horde, 92. ^ Loreology on Twitter. "At least one draenei (Velen) is immortal. We haven't specified about the others, though some do remember Argus." ^ Loreology on Twitter (2014-02-06) "Not in all art! The one I was asked to review was Ludo's art for Velen's short story. Alabaster is canon. :)"
^ Rise of the Horde, 82. This page was last edited on 14 February 2019, at 04:14.